Are you thinking about the social impact of your investment? We provide resettlement services and accommodation for refugees and are looking to rent houses on long term leases. We currently need Bristol properties from one bed flats, to two, three and up to 5 bedrooms, and can offer competitive monthly rents from £600 to £1,200 respectively based on quality and size. or call 0117 954 0433.
or call 0121 565 3384. ACH has been working with Bristol City Council to provide an innovative solution to housing refugees in the city. Bristol City Council has agreed to lease a number of properties to ACH so that they can be used for move on accommodation as part of their refugee resettlement programme. All of the properties required extensive repair and refurbishment and the cost of this was funded by ACH. In return, the Council agreed to grant leases for 10 years at peppercorn rents in order that ACH could fund the repair work. 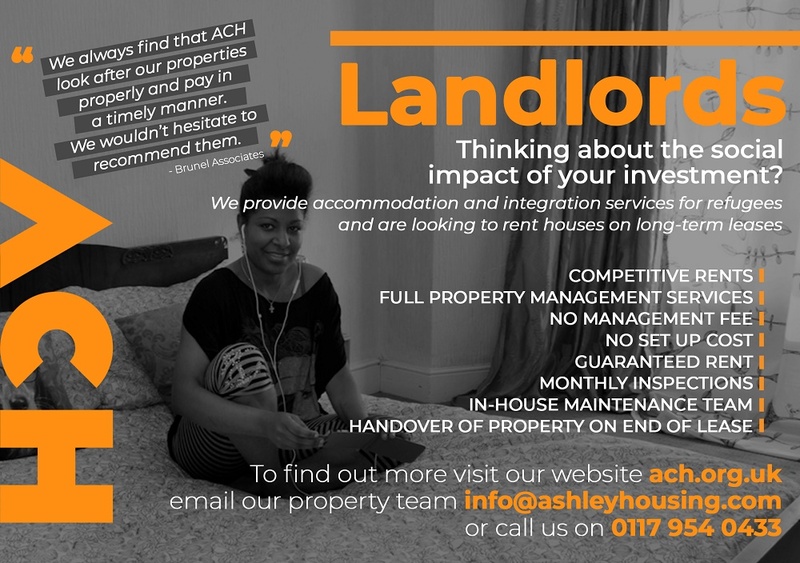 As part of the refurbishment programme, a number of ACH tenants have worked on the properties, helping them pick up construction skills.